This part of the site describes the work of developing integral mission at the Sumumpaya Community Centre and sets its work in the context of 21st century Bolivia. 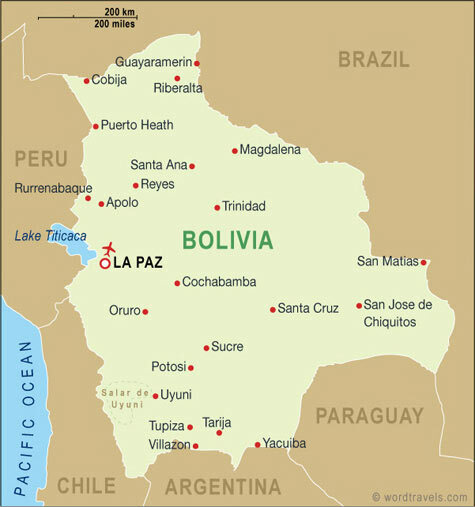 If you're not sure where it is look at the maps of South America; Bolivia is in red (left) and near its centre (below) lies the 'city of eternal spring' - Cochabamba. To the west are the Andes and La Paz and to the east are the tropical areas of Santa Cruz. In truth Cochabamba enjoys an equable climate and that's why people flocked here in the past and one of the reasons why the city is still growing. Click here to take you on to the real story of what's happening in Sumumpaya.